Today is the National Education Association’s Read Across America Day, which stresses the importance of not only getting kids to read, but for parents to read to their children. In support of that effort, and coincidentally, in honor of Dr. Theodor “Seuss” Geisel’s birthday on March 2nd, PBS Kids is launching a new Cat in the Hat online game and Oceanhouse Media is kicking off its annual Dr. Seuss app sale. This year’s theme is appropriately named “Hats Off to Reading,” and you can buy more than 40 Dr. Seuss apps on sale between today, March 1st and March 7th for anywhere between 30-75% off. 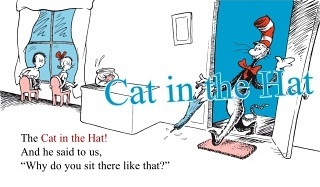 Classic titles like Cat in the Hat are available for only $0.99 (usually $3.99 for the digital book) and other digital books, book collections, short stories and games will be priced anywhere from $0.99 all the way up to $8.99 for the Dr. Seuss Beginner Book Collection that comes with five titles. The Cat in the Hat camera app is available as a free download (regularly $1.99). The Dr. Seuss digital book apps offer three reading options and simple navigation tools appropriate for the 3-8 year old crowd. The interaction includes words and illustrations wil narration, custom sound effects, word highlighting and picture/word association. The iOS versions of the digital books include a record and share feature too. Also launching today in honor of Dr. Suess’ birthday, PBS Kids will launch new episodes of The Cat in the Hat Knows A Lot About That!, along with a new online game called ““Swirly Whirly Pearl Hunt” that will be available on the PBS Kids Website starting today. In the game, the Swirly Whirly Ocean is filled with creatures of all colors, shapes and sizes, and players catch a ride on the Thinga-ma-jigger to travel through the silly schools of fish to find a Swirly Whirly Pearl. Kids will have the chance to create a personalized school of mix-and-match sea creatures in the game.